Help your youngster learn opposites with this wonderful collaboration from Tammi Salzano and Hannah Wood. 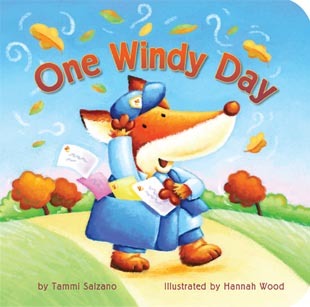 Like their previous books (One Rainy Day, One Snowy Day, One Sunny Day) One Windy Day makes learning simple and fun. Fox loves the wind, but one windy day his mail begins to blow away: up, down, left, right, high and low his fellow animal friends help him retrieve the letters so he can deliver them. This beautiful board book features sturdy board pages, soft padded covers, rounded corners, and foil stamped leaves on the cover and interior pages. I love it when these ladies work together. It’s always a joy to experience their work. Learning shapes is so much fun with this sun-loving bear. One Sunny Day means star sunglasses, a diamond kite, a square sandbox and other fun surprises. Your preschooler will enjoy following bear and discovering shapes along the way. With gold foil sunbursts on the cover and some of the interior pages, this book is sure to capture a child’s eye. 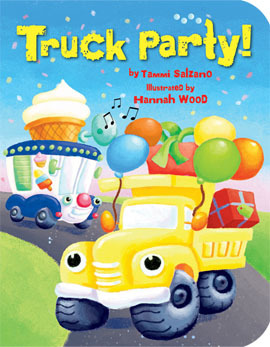 Author Tammi Salzano and illustrator Hannah Wood have teamed up on other fun titles too. Salzano’s simple text coupled with Wood’s bold artwork is sure to be loved by little ones. I’ve had a chance to read some of their other collaborations, and I have never been disappointed. One Sunny Day is a wonderful way to get youngsters in the mood for summer while teaching them a game of finding shapes around them. 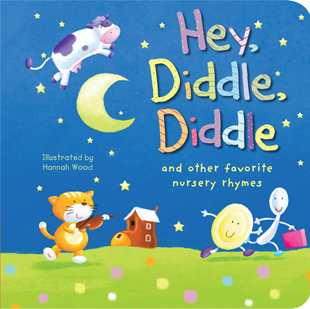 Classic nursery rhymes comes alive for your little ones with Hey Diddle, Diddle illustrated by Hannah Wood. One of the greatest things about being a parent is sharing things from your own childhood with your kids. 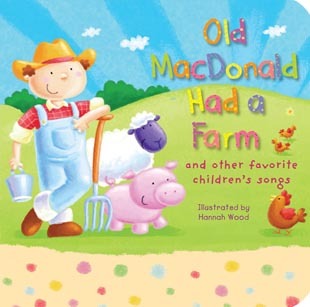 In this padded board book, classic nursery rhymes like Old Mother Hubbard, Pop! Goes the Weasel, Jack Sprat, Yankee Doodle, and many more are brought to life by Wood’s fun and colorful illustrations. Its bright cover will have kids picking this one up over and again. Great for playtime or bedtime, Hey Diddle, Diddle is a wonderful book to add to your toddler’s library. I received a free copy of this book from the publisher in exchange for my opinions. I received no monetary compensation of any kind for my review. When it’s time to learn colors, there’s nothing cuter than this great new release from tiger tales. One Rainy Day finds Duck happy for a springtime shower. A journey outside shows Duck discovering a green frog, blue puddles, and more. Ever since I picked up my first tiger tales book, I’ve been in love with this publisher. Like all the titles I’ve read from tiger tales, One Rainy Day blends a great story with wonderful illustrations to come up with a winner. This is a simple story to relay simple concepts, but with the stunning artwork of Hannah Wood, Duck’s rainy day jaunt comes alive. I’m going to pass this book along to my nephew. He’ll be needing it before too long. This board book is geared toward kids ages 2 to 5. It’s sturdy and will hold up to many readings. 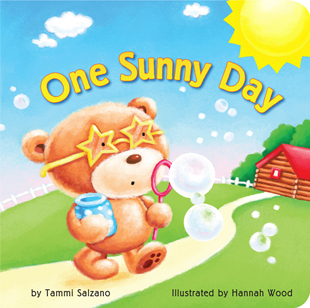 Come enjoy a colorful spring time story in One Rainy Day by Tammi Salzano! Counting from one to ten has never been so much fun! Penguin loves snowy days. That’s because snowy days mean…one woolly hat, two warm mittens, three happy friends–and so much more! 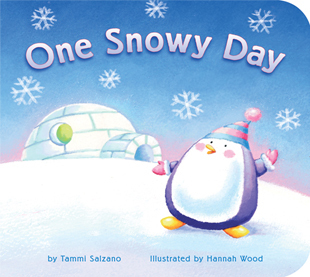 One Snowy Day by Tammi Salzano will have your preschooler counting from one to ten before you know it. This beautiful padded board book with foil-stamped snowflakes on the cover and inside pages, will delight your child while helping him learn to count. Artist Hannah Wood has created some darling illustrations for this one, using soft wintry colors to bring penguin’s story to life. A wonderful seasonal read is what you’ll find in One Snowy Day.